BARNARD CERMENATI Carver, Gilder, Picture Frame is Looking Glass Manufacturer No. 10 State Street, Newburyport Keeps constantly for sale at the most reduced prices A complete assortment of Looking Glasses, Picture Glasses, Prints, Spy Glasses, Thermometers, Glazier, Diamonds of the firs! quality, Drawing Paper, Paints, Pencils, Etc. Ladies' Dressing Glasses of all sizes. Looking Glass Plates of all sizes to fit old frames. Window Glass of all sizes. 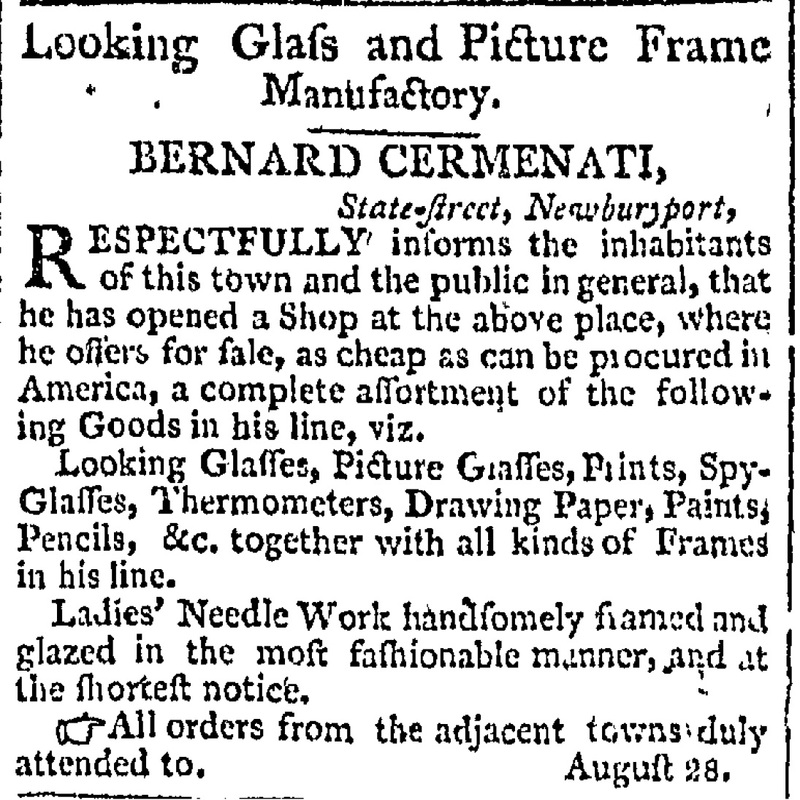 With all kinds of Frames in his line.Gentlemen and Ladies will gratify Mr. C. by calling and examining the above articles, whether they purchase or not. (Below I have posted a few articles found in the old news paper archives) According to Harvard Magazine Bernard Cermenati was from Italian origins. He was in partnership with John Bernarda and later with Monfrino. 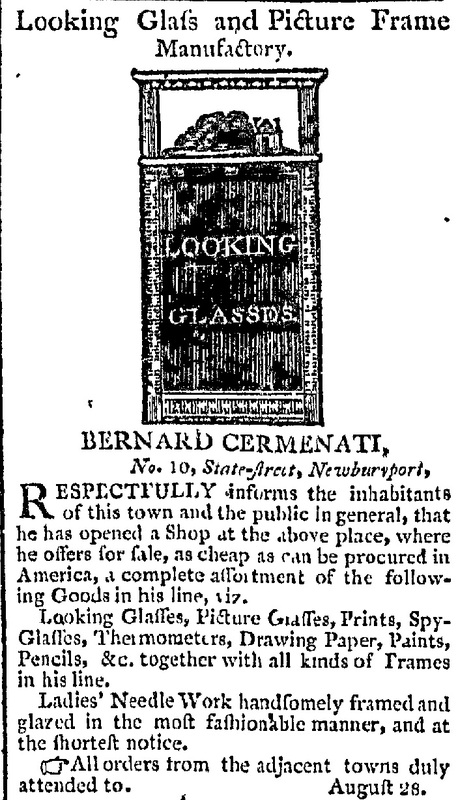 In 1807 Cermenati opened a looking glass store at 10 State Street in Newburyport. Historic New England Collections notes he moved to Salem at the end of 1809.REF: Webster Signature Cermenati made and sold telescopes and thermometers. Essex Street, Salem; No. 2 State Street Boston (1807); both in Mass. A reference in Antiques and the Arts Weekly: Americanists no doubt spotted Thomas Coulborn & Sons. 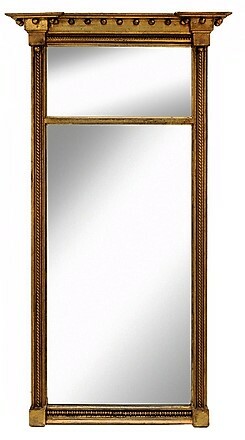 The West Midlands, UK, dealer handsome pair of Bilbao mirrors. 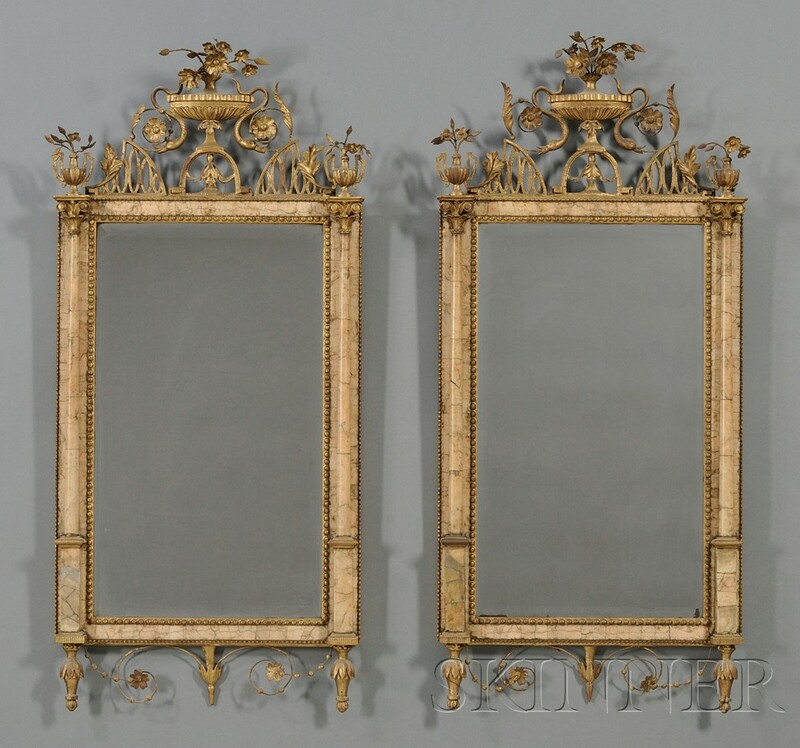 Made in Spain around 1809 the mirrors with Cermenati’s label are in the collection of Historic New England and Coulborn’s pair once belonged to New England collectors Judge Arthur Beane and his wife, Mary Elizabeth Clarke. 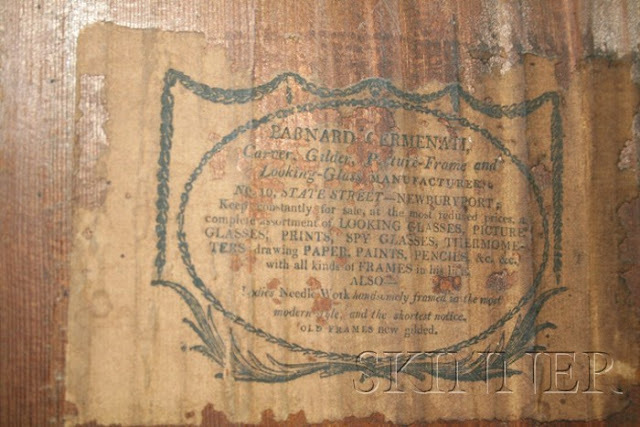 Skinner auctioned pieces inherited by the judge’s son, Arthur Beane Jr of Duxbury, Mass., in November 2010. 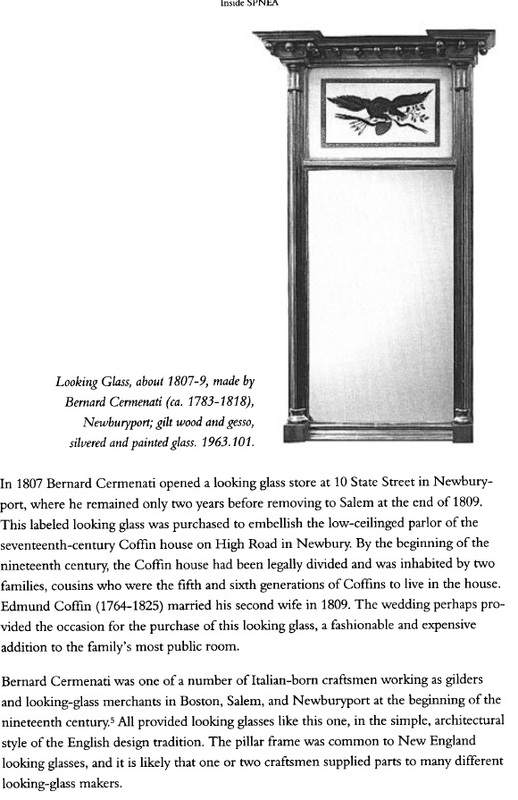 Historic New England as noted in article Newbury Furniture by Nancy Carlisle. Imported and retailed by Bernard Cermenati (Newburyport, Massachusetts) c.1805-1809. Collection of Judge Arthur Beane Sr and his wife Mimi Clarke, daughter of the noted silver expert Herman Frederick Clarke. 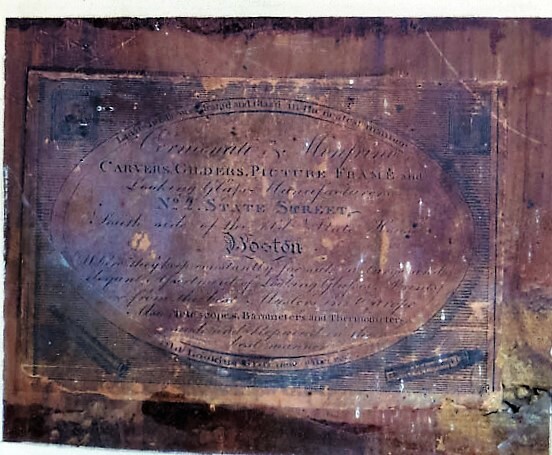 They collected in the 1920s and 1930s, and lived in the William Sever House in Kingston, Massachusetts, after which they moved to Duxbury, Massachusetts. By descent to Arthur Beane, Jr.
Collection of Judge Arthur Beane Sr and his wife Mimi Clarke, daughter of the noted silver expert Herman Frederick Clarke. They collected in the 1920s and 1930s, and lived in the William Sever House in Kingston, Massachusetts, after which they moved to Duxbury, Massachusetts. By descent to Arthur Beane, Jr.
“Bilbao mirrors reached America about 1790-1810 in some thus far unexplored phase of [America’s] trade with Europe. They take their name from Bilbao (formerly sometimes written Bilboa), a port in northwestern Spain near the French border that was frequented by American merchant ships in the 18th century.” (Comstock op. cit.) Interestingly, these mirrors retain the original label of their importer Bernard Cermenati. 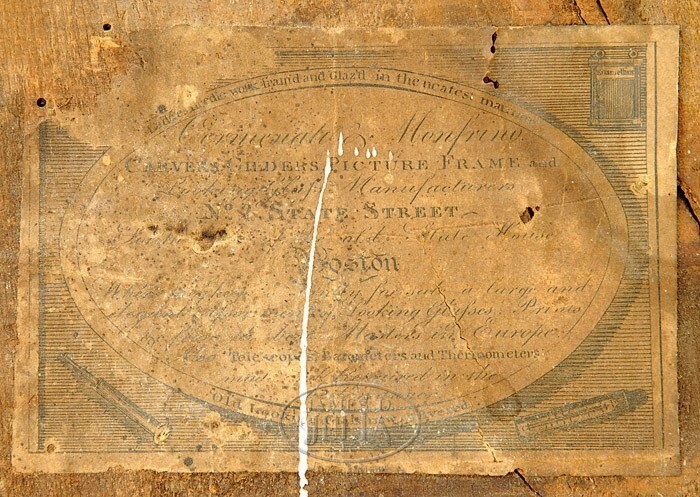 Cermenati was an Italian immigrant working in eastern Massachusetts in the early nineteenth century. 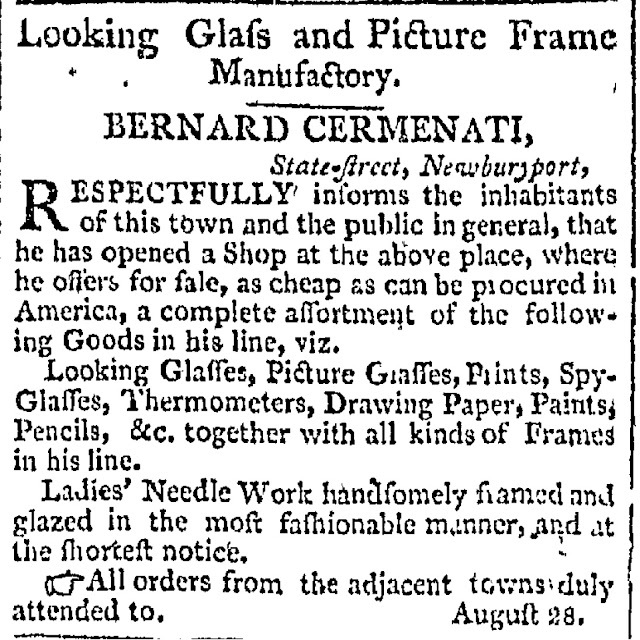 His earliest recorded advertisement was on August 28th 1807, in Newburyport, as a carver, gilder and looking-glass and frame maker. His store there was located at 10 State Street. 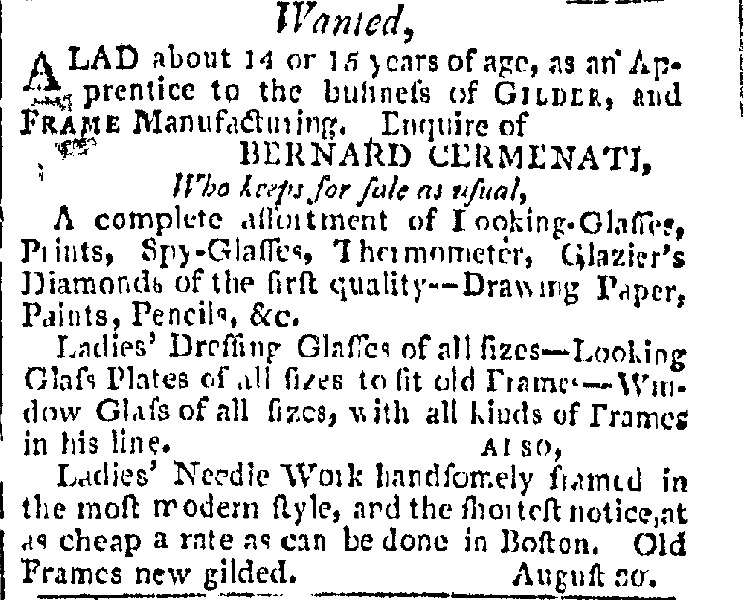 He remained there for two years before removing to Salem at the end of 1809, and is listed in the Boston directories in 1811 and from 1813 to 1818. 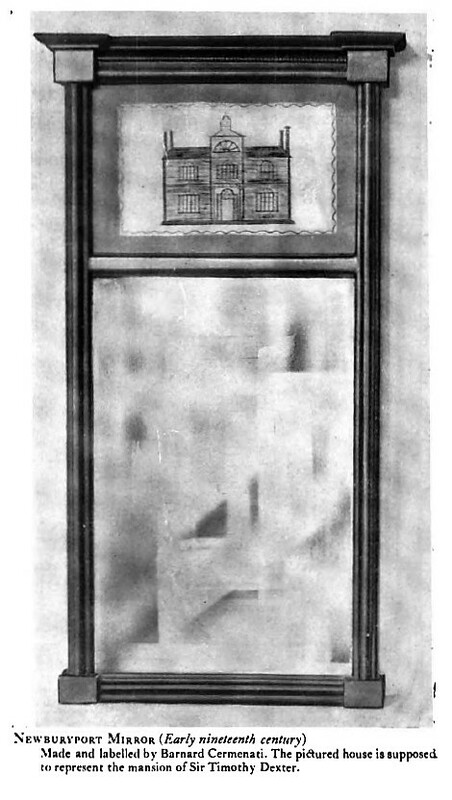 Literature: In The Looking Glass in America, 1700-1825, by Helen Comstock, a pair of similar Bilbao mirrors are illustrated, p. 80, fig. 53. 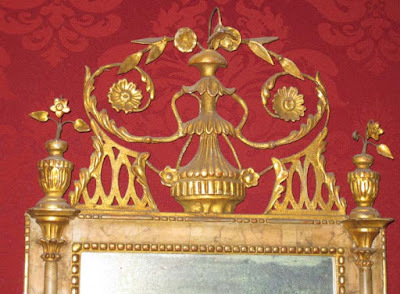 John & Rico's Antique American and European Furniture from Their Drawing Room of Newport. Located in Newport Rhode Island # 5220. A pair of fine late 18th early 19th century Bilbao Mirrors. Size: 15" wide and 32" tall. 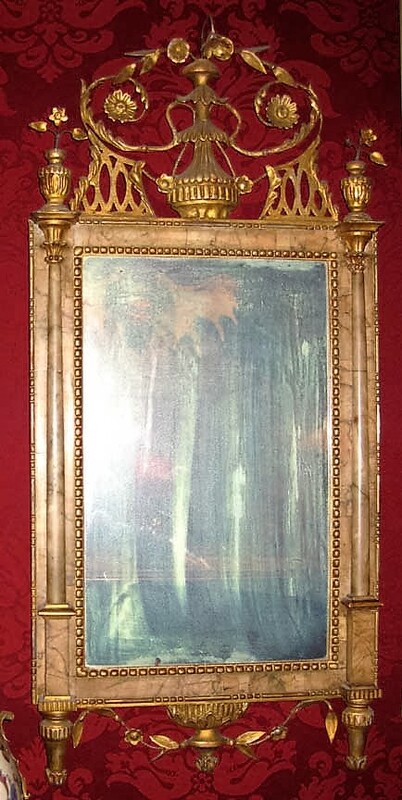 Condition: the gesso/wire decoration is in excellent condition and the gilding appears to be intact; the mirror/glass is appropriately distressed because of age (when these mirrors were first used, people with powdered wigs were looking at their reflections); the marble columns and framing may have had some restoration over the years, but there are no apparent serious problems. These mirrors are more commonly seen in finer New England 18th century homes. It is rare to find a pair in such nice condition. A similar pair are on exhibit at at the Minneapolis Institute of Arts, (G328). Literature: In The Looking Glass in America, 1700-1825, by Helen Comstock, a pair of similar Bilbao mirrors are illustrated, p. 80, fig. 53. Comstock writes, "Bilbao mirrors reached America about 1790-1810 in some thus far unexplored phase of [America's] trade with Europe. They take their name from Bilbao (formerly sometimes written Bilboa), a port in northwestern Spain near the French border that was frequented by American merchant ships in the 18th century. 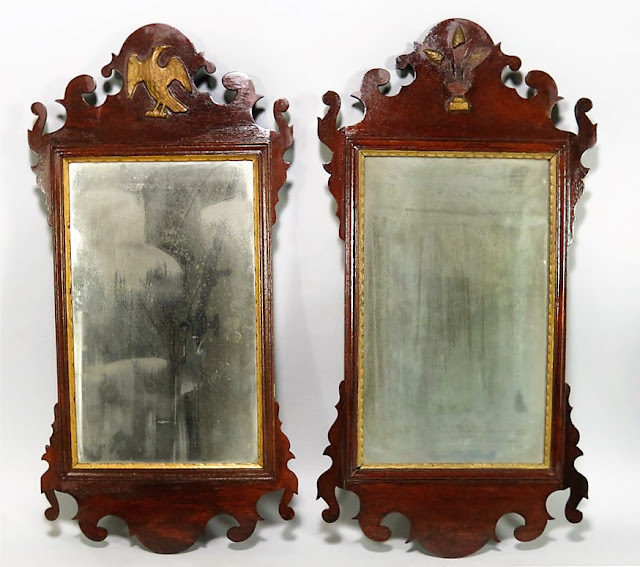 Note: A similar pair of mirrors sold at Skinners Auctions for almost $22,000.00 in the Fall of 2010 with labels reading: "Bernard Cermenati, Carver, Gilder, Picture Frame and Looking Glass Manufacturer, No. 10 State Street - Newburyport." Our mirrors are un-labeled. Price: $22,500.00 the pair. 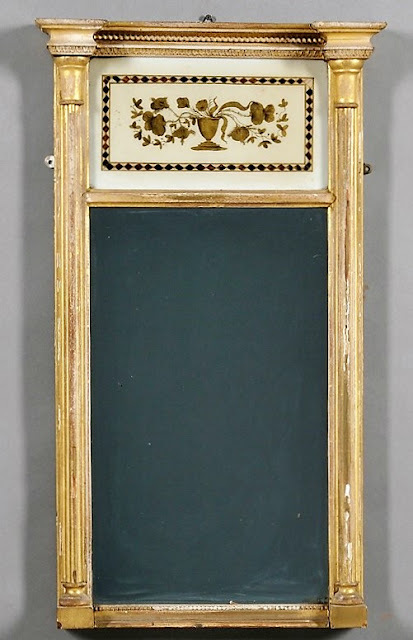 Mirror-Wall; Federal, Gilt Wood, Cermenati (Bernard) Label, 52 inch. 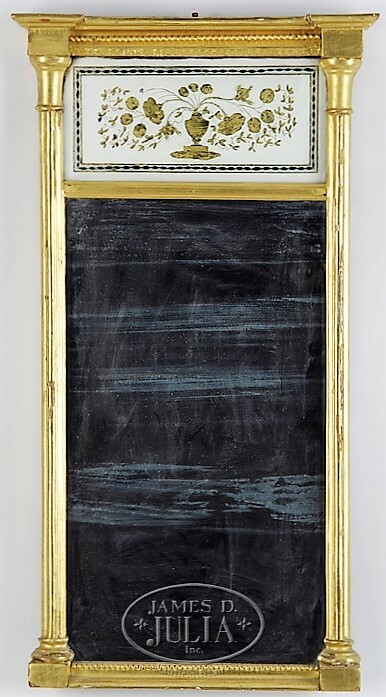 A rare signed Federal giltwood mirror, labeled by Bernard Cermenati Portsmouth, New Hampshire, early 19th century. Cermenati married Mary Rose Francis on April 10 1808 and vital records show one son Joseph, born November 4, 1808. 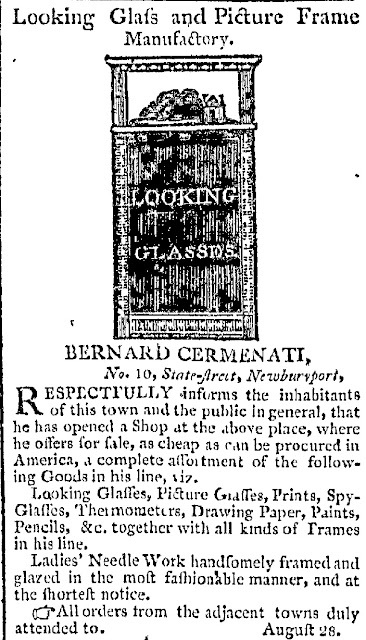 Mary Cermenati looking glass store 6 Hanover St. (1818). Chipstone Nancy Goyne Evans The Written Evidence of Furniture Repairs and Alterations: How Original Is "All Original?" 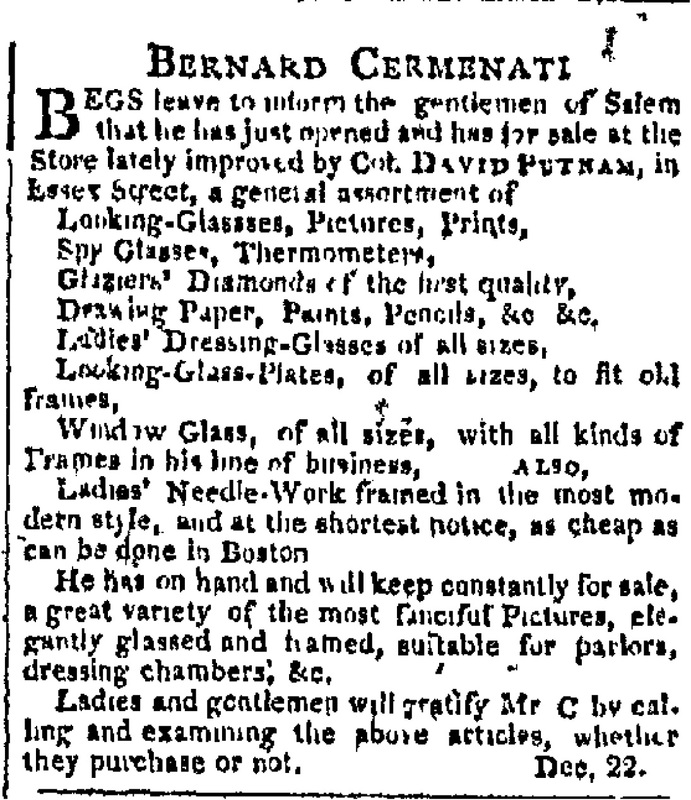 Barnard Cermenati, April 19, 1810, to Joshua Ward, Salem, Massachusetts, Ward Family Manuscripts. Vital records of Newburyport, Massachusetts to the end of the year 1849. Skinner Ma American Furniture & Decorative Arts - 2786B Boston March 01, 2015 Description: Mahogany and Gilt-gesso Mirror, Boston, Massachusetts, c. 1806-07, the scrolled frame with pierced cresting of feathers and gilt incised liner, chalk inscription on backboard "Cermenati & Bernarda," 30 x 15 3/4 in. I've had probably a dozen over the years, Melissa--but none now. There's quite a bit of info on him- seemed to work( and have business labels made and applied!) from Boston to Newburyport.